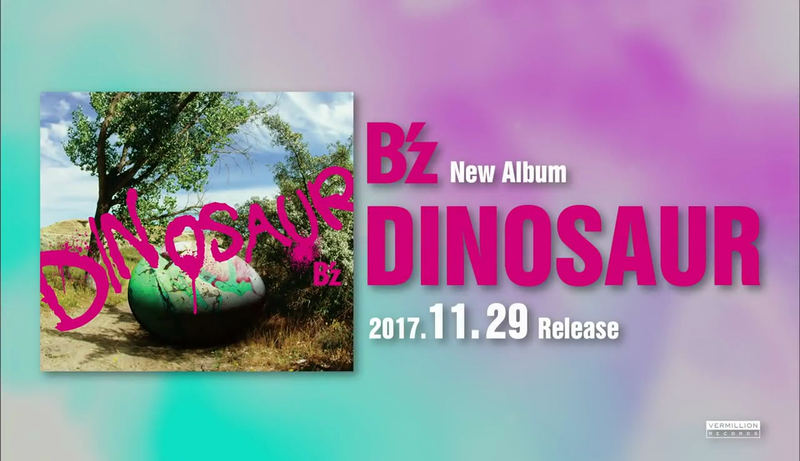 LIVE DINOSAUR Home Video Released & B’z Message Translated! 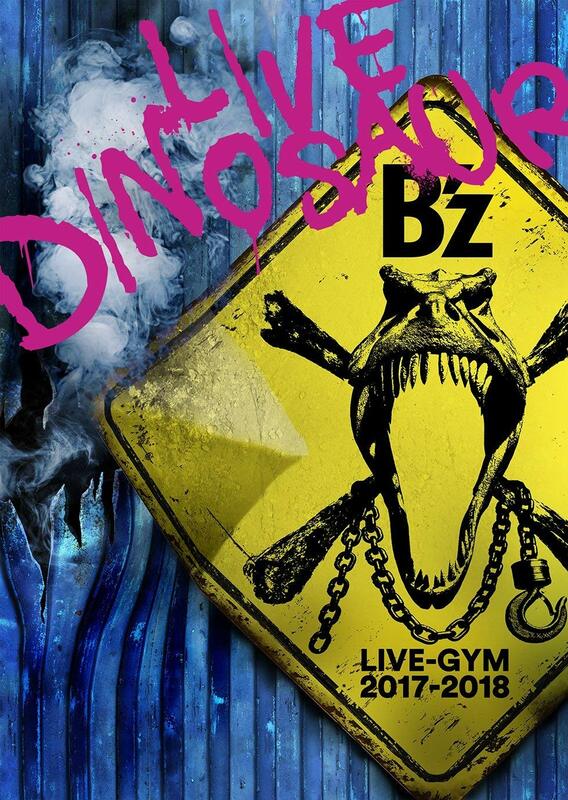 Today is the release of B’z LIVE-GYM 2017-2018 “LIVE DINOSAUR” on home video! As can be seen above, we have translated the band’s customary release message and archived it for those interested. Both DVD & Blu-ray editions are now available from the following retailers. 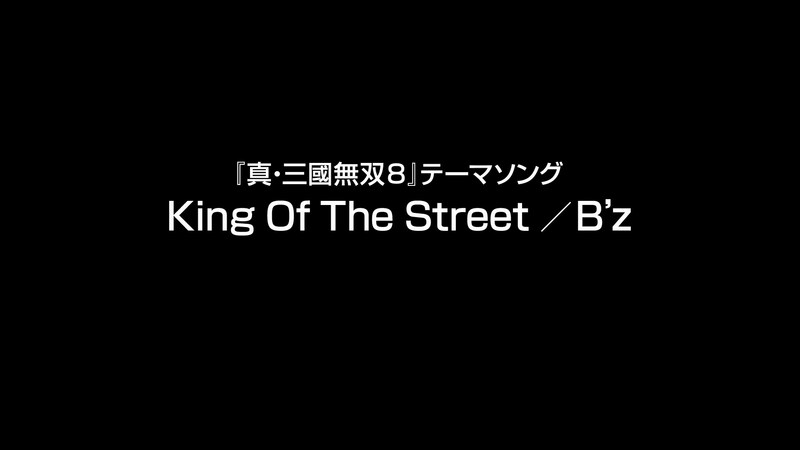 The first promotional material for B’z LIVE-GYM 2017-2018 “LIVE DINOSAUR” on Blu-ray & DVD has just been aired on Japanese television. As shown above, the commercial utilizes the audio from “Akai Kawa” in its debut appearance on home video. 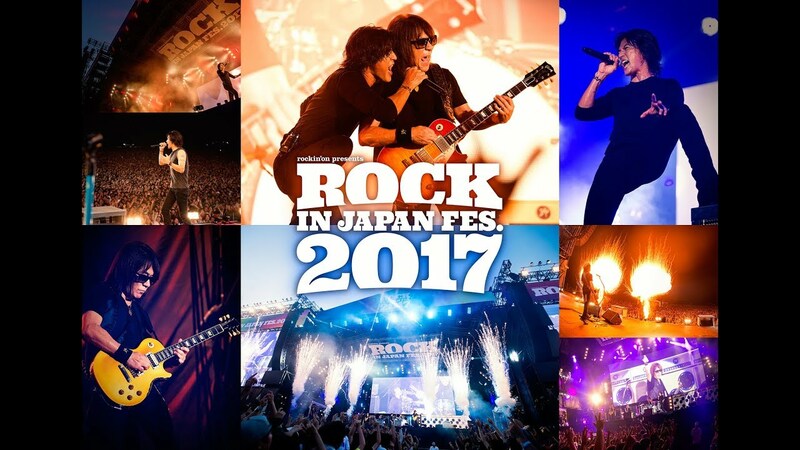 As previously reported, both the two-disc DVD and single disc Blu-ray packages will be available on July 4, 2018, for a price of 6,800 Yen ($61.28 USD) with 21 songs performed in all—thirteen of which are making their home video debuts! UPDATE: A second commercial is now airing with glimpses at even more songs and footage. 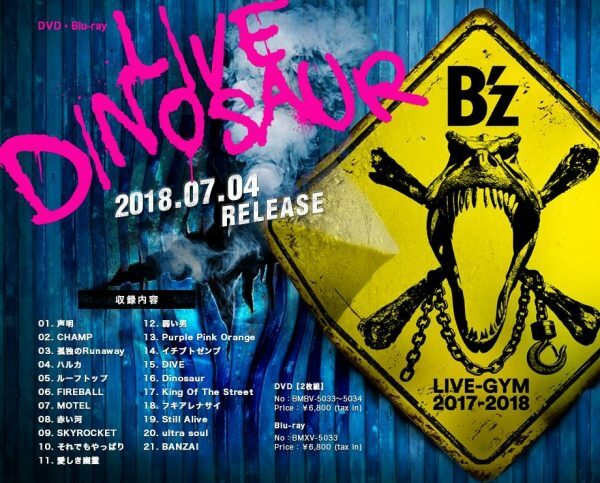 B’z LIVE-GYM 2017-2018 “LIVE DINOSAUR” on DVD & Blu-ray July 4, 2018! 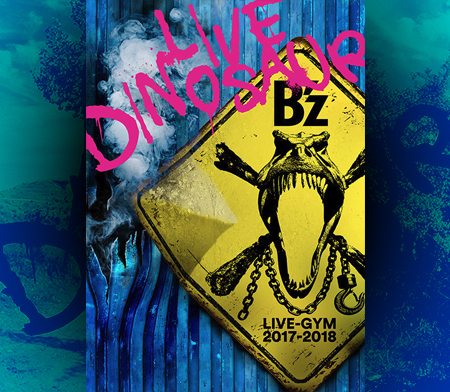 Some five months after the close of the tour, we finally have confirmation of the first release for the B’z 30th year commemoration: B’z LIVE-GYM 2017-2018 “LIVE DINOSAUR” on DVD & Blu-ray! Their most recent tour, the eighteen-date stand featured all but one song from the titular twentieth studio album DINOSAUR alongside a slew of classics including “ultra soul“, “BANZAI“, and “MOTEL“. Recent double A-side single tracks “Seimei” and “Still Alive” were likewise joined by the long-awaited return of 1997 single “FIREBALL” after lying dormant for fifteen years. The 1994 album ballad “Akai Kawa” from The 7th Blues receives similar treatment as it not only makes its home video debut but also is performed for the first time in twenty-three years! As previously reported, the taping was done at the Saitama Super Arena.on January 13 and 14. 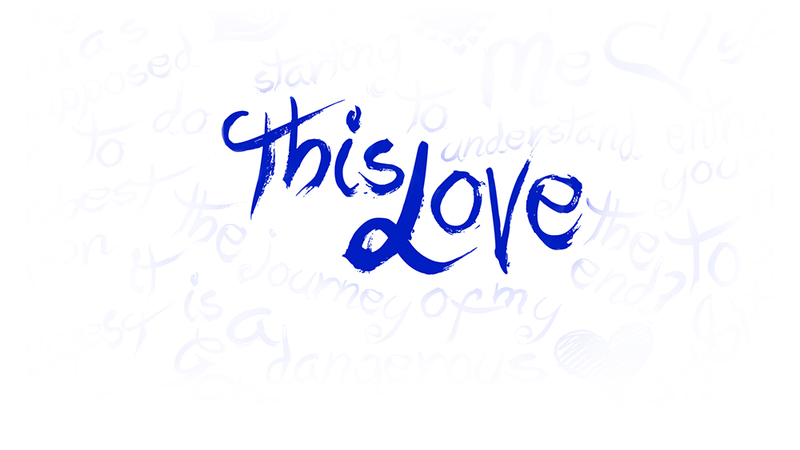 Both the two-disc DVD and single disc Blu-ray packages will be available on July 4, 2018, for a price of 6,800 Yen ($61.28 USD) with 21 songs performed in all—thirteen of which are making their home video debuts! Ajinomoto Stadium where B’z famously performed with American rock legends Aerosmith in 2002. Gibson to Release Reissued Tak Matsumoto Signature Les Paul? 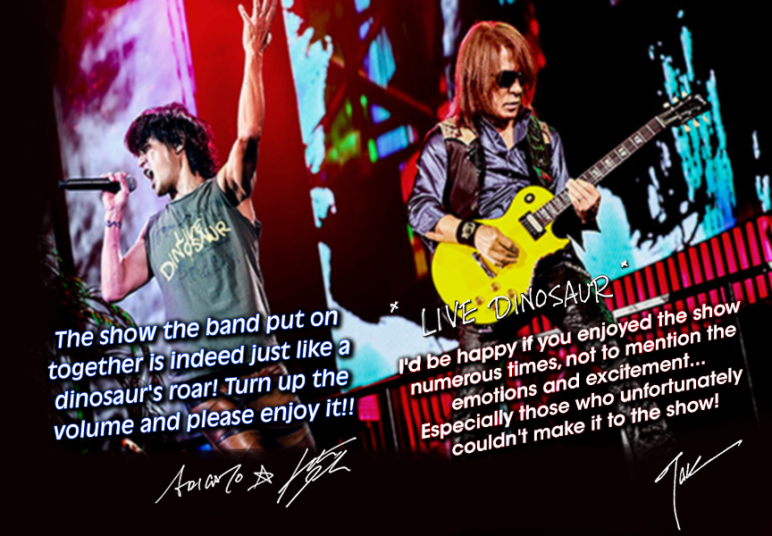 In recent live appearances, including those for television and as part of B’z LIVE-GYM 2017-2018 “LIVE DINOSAUR”, Tak Matsumoto has utilized a litany of guitars from his massive collection. This includes several of his signature models from the Gibson Custom Shop, but an inclusion that caught particular attention was what appeared to be the 1999 Gibson Les Paul Tak Matsumoto signature guitar in Canary Yellow. This was unusual because the guitar was last used as part of B’z LIVE-GYM 2001 “ELEVEN” and has not seen the live stage in the years since. Tak’s history with Gibson guitars dates back to the early 1990s. 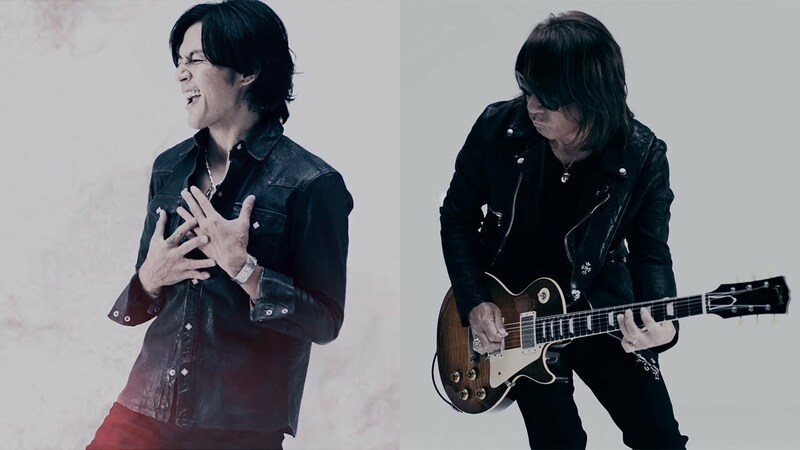 In 1994, after B’z had topped the Japanese music industry, Tak became the owner of an extremely valuable guitar: an original 1959 Gibson Les Paul Standard, serial number #9-1156. The instrument, now worth hundreds of thousands of dollars, is not used live as a precaution but has been used during recording over the years. A reproduction of this guitar was made as a limited edition for the Japanese market in 2016. Left: Tak Matsumoto in promotional photo for his first Gibson Les Paul Signature in 1999. Right: Autographed edition of the guitar donated to the Hard Rock Cafe in Japan. 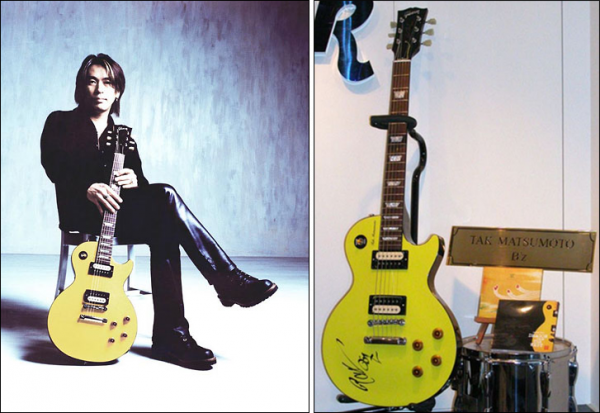 By 1999, after B’z made headlines with B’z The Best “Pleasure” becoming the best-selling album in the country’s history and its similarly successful companion B’z The Best “Treasure”, Gibson approached Tak with the prospect of becoming their latest Les Paul signature artist, and the first from Asia. 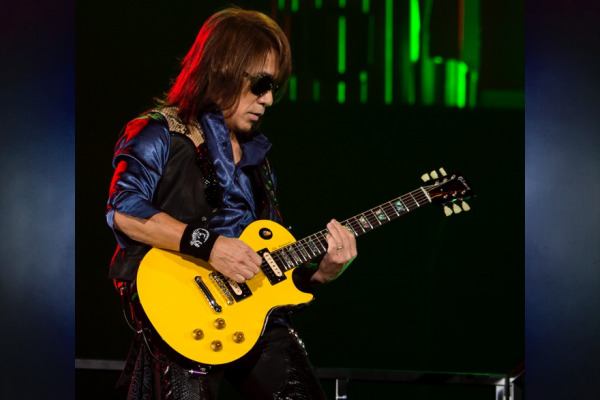 In time, Tak has become the guitarist with the most signature instruments produced by Gibson. Whether the guitar will be reproduced and released akin to his past signatures or is a limited reissue prepared to commemorate the band’s thirtieth anniversary has not been confirmed.